NEW ZEALAND (WABC) -- The wedding rings were made of pasta, and the kiss involved sucking on spaghetti. 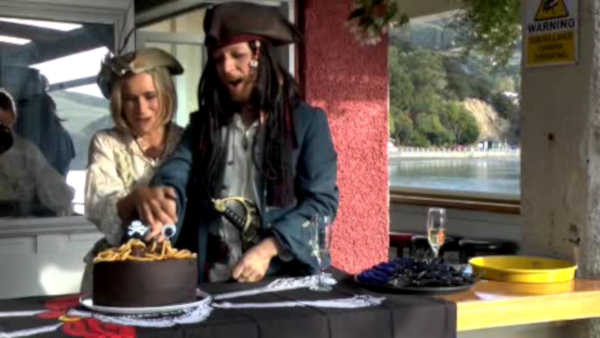 On Saturday, New Zealand hosted the world's first-ever Pastafarian wedding. The wedding was held on a pirate ship, and was officiated by the Church of the Flying Spaghetti Monster. The religion began in the United States as a protest against religion in public schools. It has been battling to gain legal recognition around the world, and New Zealand recently decided in can legally officiate weddings. The wedding feast was, of course an all-pasta affair. The church also claims global warming is caused by pirates vanishing from the high seas, and that there is a beer volcano in heaven.